Day 4 after surgery and I thought I'd attempt a post. If I start to drift zzzzzzz zzzzzzzz zzzzzz zzzzzzz zzzzzzz just hit the computer and I'll wake up. 7:30 AM Into surgery. I just remember the ride. 3:00PM Surgery lasted for almost 8 hours and when it ended I was wheeled into Recovery. Here's where it gets very fuzzy for me. Debbie came in while they were waking me up and sister Keli was there. Apparently, I was not happy to find out that my catheter was not removed before I woke up and I wanted Keli to know about it and to check it out (also to check out its contents for some ungodly reason). Debbie kept telling the nurses that I really don't have a "potty" mouth. They told her that they have heard it all ... much worse than me to which I replied ... " I do have a f***ing potty mouth ... but I love you guys cause you gave me great f***ing drugs." I have no other earthly idea what else I said on the ride to the Neuro ICU ... except that I did talk to the cool dude who transported me and asked him where he was playing. ... sorry where was I? Oh yeah Neuro Intensive Care Unit. Still feeling the glow of the anesthesia drugs I talked to Dr. van Loveren who is the greatest doctor in the world. I told him that when he came in to talk to me and ask how I was doing. He told me this later: The surgery was a little tougher than he thought so they had to do more ... longer ... and brought in another neurosurgeon to help out. I had the BEST (... he got the WHOLE tumor by the way). He did tell me that "I would call him an a**hole for the next few weeks because I'll have a killer headache and feel like crap." I told him "You were always an a**hole (his three residents loved hearing that.) But you're my favorite a**hole ... love ya man." Feeling NO Pain! 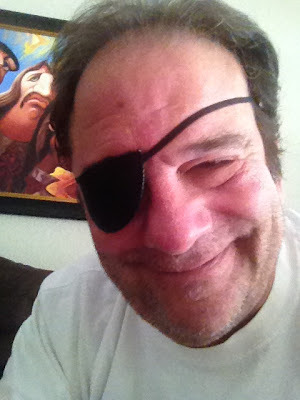 I am doing well ... left the hospital on day three ... now at home and trying to heal. Never got the "haircut" ... Harry cut right through my hairline ... now closed by a bunch of staples. Double vision causes me to wear a patch and complete numbness across the right side of my face, my eye and nose is a little disconcerting (kinda like wearing the skin coat in Silence of the Lambs). Most will disappear hopefully over the coming weeks but will have to wait and see what nerve irritation is more permanent. The good news is ... I'm alive, in no real pain, have no paralysis and I can hopefully lose some weight. since the taste nerves on the right side are numb too. But ... Tomorrow I'll give the reasons why feeling numb is pretty cool.